“There will come a time when there will be no more Christians in Syria,” the Syrian Presbyterian Rev. Dr. Riad Jarjour, former General Secretary of the Middle East Council of Churches, warned recently on January 27, 2014, at Washington, DC’s Heritage Foundation. Jarjour explained Syrian Christians’ “stage of hopelessness” while “boxed in” by Muslim sectarian fighting in Syria’s civil war during two successive presentations by a Syrian Christian delegation. Jarjour at Heritage, meanwhile, discussed how Syrian Christians are “pressured to leave” by Sunni jihadist groups fighting for the overthrow of Syria’s Shiite-backed dictator Bashir Assad. Jarjour recalled one funeral of a Christian beheaded by such jihadists as well as the severed heads of two Armenian Christians sent to children as a threat. Jihadists also used Christians as human shields in the Syrian town of Homs. 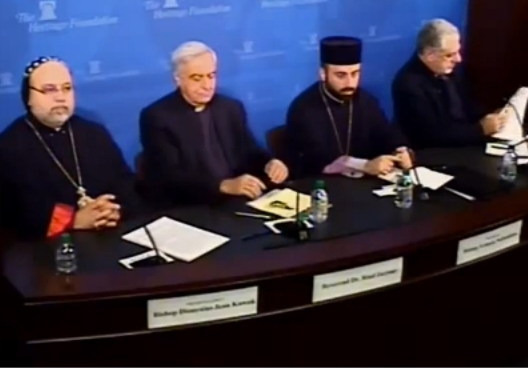 Kawak at Heritage also referenced the kidnapping by jihadists of Syrian nuns and bishops. Such “very radical Islamist groups” entering Syria meant that local Christians had abandoned their support for opposition groups initially given when protests for reform of the Assad regime began in March 2011. Many of these groups were linked to Al Qaeda that, “contrary to popular opinion…is alive,” Sookhdeo noted at Heritage. Jarjour at Heritage saw a worrying precedent in Syria’s neighbor Iraq, where Muslim intimidation had expelled 70% of that country’s Christian population following Saddam Hussein’s overthrow. Rev. Adib Awad, General Secretary of the National Evangelical Synod of Syria and Lebanon, explained at St John how such Muslim repression of Christians is not new. Jews and Christians are “second-class citizens in a religious state” under orthodox Islamic laws, he explained. While not always enforced in the past, these laws mandated distinctive clothing for Christians and low door construction in Christian dwellings so that Christians would humiliatingly bow upon entering. Muslim repression also resulted in destroyed churches while Ottoman Empire rule in Syria enslaved Christian youth as soldiers in the Janissary Corps or as haram concubines. While non-Muslims have had some freedoms under past Muslim rule, “it can change anytime,” Adib said to this author at Heritage. Christians in the region have thus endured “different periods of fear for their future,” Kawak observed at Heritage. As a result of such centuries-long repression, modern Syria’s population is only 10% Christian while the region was essentially completely Christian before Islamic conquest in the seventh-century. Amidst their present sorrows the visiting Syrian Christians maintained future hopes. For Christians who “want to continue to be part of Syrian society,” Kawak at Heritage sought a “secular democratic state” in a “new Syria.” Worried about “third- or fourth-class citizenship,” Syrian Christians wanted “full equality for all.” In such a Syria Christians could be “advocates of interreligious dialogue,” Nalbandian argued at Heritage. To this end Syrians should “use dialogue rather than power” in deciding Syria’s future, however difficult this might be, Kawak urged at Heritage. This reflected the Syrian Christian “attitude of neutrality” toward sectarian conflict. Jarjour at St. John also termed himself a “person of dialogue” while calling for peaceful reform in Syria. “We want peace” and “terror to stop from any side,” Awad likewise affirmed at St. John while supporting the Geneva negotiations. Yet along with other delegation members, Awad at Heritage refused to express specific political views, saying “I don’t like to talk politics” in response to a question about Assad. As one audience member observed in private conversation, political remarks could be hazardous for the Syrian Christians in their war-torn homeland. Questioning official American demands that Assad leave power, Awad suggested United Nations-supervised elections in Syria that Awad felt Assad would actually win with about 70% of the vote. American diplomats have privately agreed with Awad, he said, and added to this author at Heritage that a European foreign minister had expressed this view as well. While all of Syria’s minorities supported Assad, Awad estimated that 60% of Syria’s Sunni majority would support Assad against the jihadists. My heart breaks for the loss of Christianity in Syria and the world. The Church must understand the Islamic doctrine of jihad and the concept of dhimmi status. The actions and kindness of individual Muslims may give hope, however the reawakening of Islam has brought Islam’s “prime directive” to the fore…jihad in the way of Allah to impose his law (the sharia) globally. Unless you know this and become familiar with sharia law, you will continue to decline. This is a global effort to instill terror, impose dhimmitude or annihilate your presence. All to the detriment of Christians and to all people who will suffer under the sharia. Citizens across the globe are trying to push their elected representatives to understand this as well, and form a coherent response.